Sorry for the absence, Dave & I are away for a week long break to the North Coast and internet here is pretty impossible to get. I love getting away and being by the beach but not having instagram and twitter nearly kills me! The weather for the past week has been amazing, my car registered 29 degrees the other day?! Seriously if the summer's here were like this all the time there would be no need to go away for holidays. Its been so great pulling out all my light colourful breezy clothes and not having to worry about being cold. 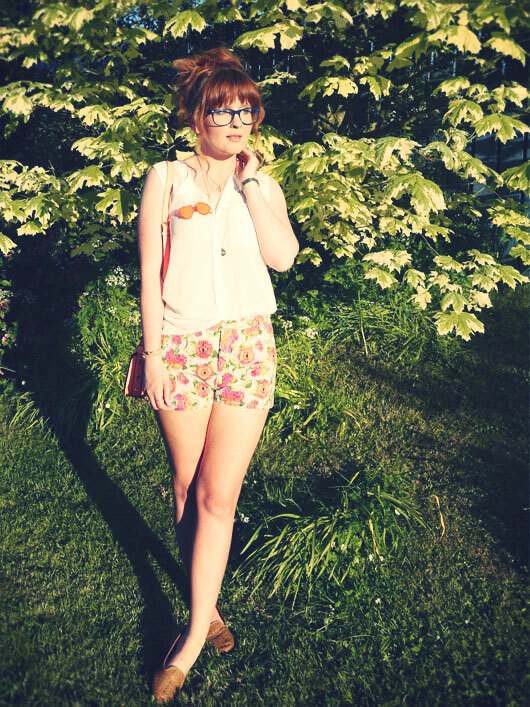 Top: H&M, Shorts: Zara, Loafers: Primark, Bag: H&M, Sunglasses brooch c/o Tatty Devine, Pinwheel necklace: Gift, Luck necklace: Accessorize. These shorts have been waiting patiently to be worn for months now, I got them for my birthday in April and wore them with the matching sweatshirt (seen here) black tights and heels. But I love how the look here teamed with bare legs and a light vest. Love all the little touches, very cute! oh gosh, those shorts are so lovely! you have such a wonderful style, i love this look! Love those shorts! Glad you are having a good break and getting such great weather, can you send a little sun over here please?! Those shorts are perfect! I also love the little glasses brooch. Very pretty look. 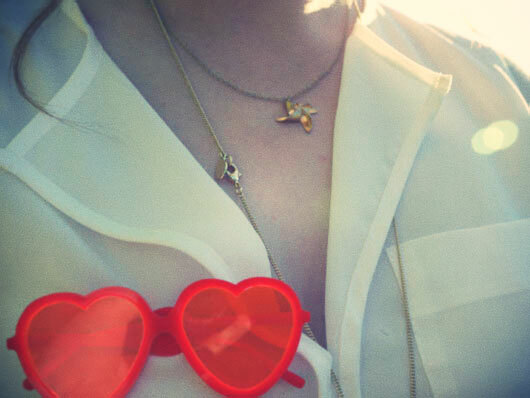 Thanks for your comment x Love the sunglasses brooch! Love your shorts! I have some waiting to be worn too, but it's been so cold lately. Wish it was summer here! 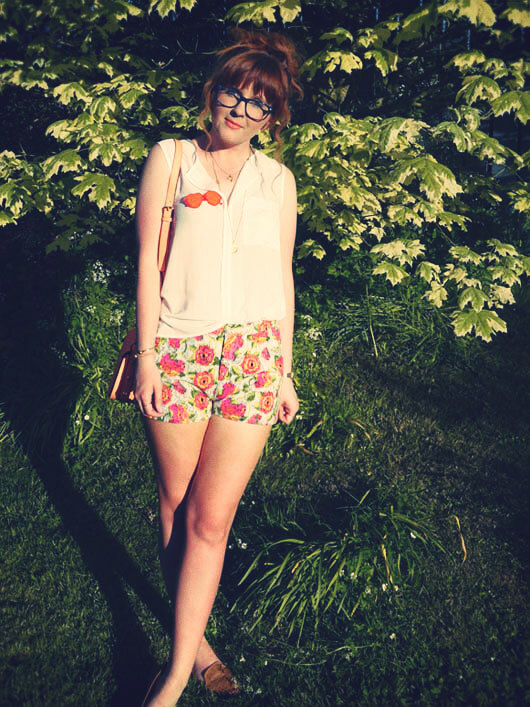 Lovely summer outfit, the shorts are lovely and the sunglasses brooch is cute - good old tatty devine. You look lovely here, your shorts are so cute! You look so incredibly pretty and summery! 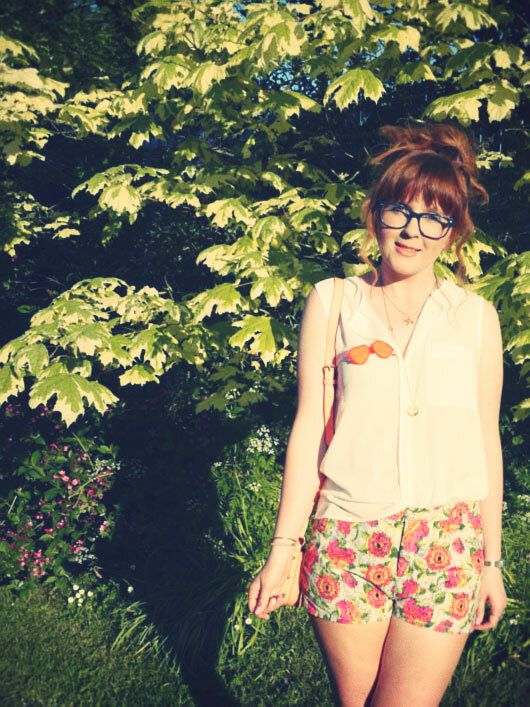 I love your floral shorts so much and that sunglasses brooch is awesome.